* LARGE Swimming Pool, * Large Hot Tub, * Satellite, Wi-Fi, * American style Outside BBQ kitchen * Champagne Welcome Basket * On call Local Rep. to ensure you have an Amazing Stay!. The area offers golf, sailing, scuba diving, water skiing, climbing, windsurfing, canoeing, cycling, tennis, walking parascending, horse riding, jet ski, go-carting, aqua park, sports complex, snorkeling, swimming and sea fishing. Within the town of Moraira, there are many excellent restaurants, bars and clubs, together with modern supermarkets. It is also only a 40 minute drive to the theme parks Terra Mitica, Terra Nature, Aqualandia and Mundomar just outside Benidorm. A night at the Benidorm Palace is highly recommended. Free WiFi internet access is provided. We had an excellent stay at Casa Havana. The villa was spotless, perfect in size for 3 families and had an excellent pool to while away the hot afternoons. The pool area was delightfully shady in the late afternoon, which was a blessing. The villa was sprawling with numerous terraces and eating areas and with a great BBQ set up. Only a short drive to town, which was not an issue for us, and close enough to large supermarkets in order to stock-up! Thank you for a great holiday!! What a wonderful villa, so much character, utterly beautiful! It was clean, organised and well equipped for our stay. April was so helpful and kind. We were two families travelling with children. The villa was perfect, large enough for us all to be together but still have perfect little areas for quiet private contemplation. So many secret balconies and nooks were perfect for a calm hour with a book before enjoying a lovely large BBQ with everyone! The pool is massive, much bigger than expected and the hot tub was gorgeous. I loved the BBQ area the most, such a great spot. Such a great holiday, we will be back! We stayed at Casa Havana with our extended family (6 adults + 3 kids). This villa had plenty of space and an added den / retreat downstairs where the kids managed to keep themselves entertained - which was a blessing! The Villa had everything we needed, a large living area and kitchen which made family get-togethers over food a delight, plus a huge pool set amongst lovely gardens. The hot tub is new and the BBQ area is great for entertaining. 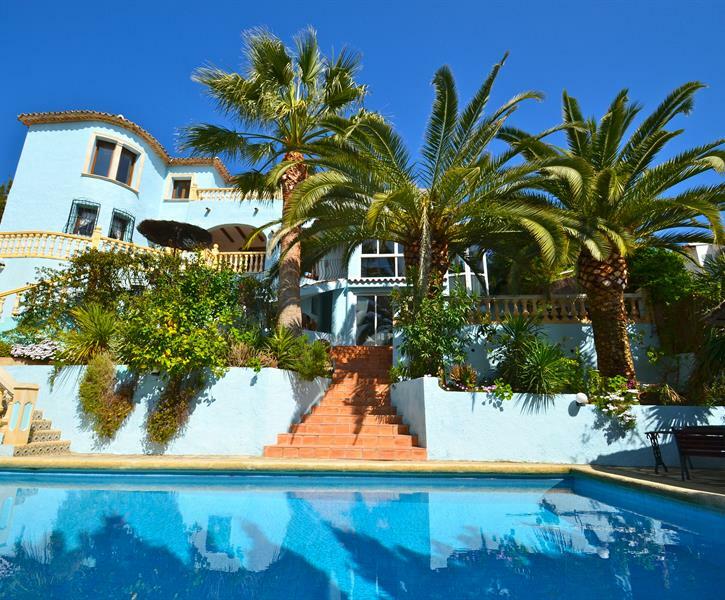 The villa is a 15 min walk from stunning El Portet beach and lovely restaurants / bars. Moraira town centre is a 10 min drive. Definitely one of the best villa's we've stayed at in Spain and April and the team were great at helping us settle in. The welcome basket was a special touch and really appreciated, thank you! 11 people fann denna recension hjälpsam. Went to this gorgeous villa with a group of nine friends and had the most enjoyable holiday. The villa is beautiful, very spacious and has everything you need. Beds are comfortable, kitchen is a lovely farmhouse style with large table, perfect for large groups and then you have multiple options for eating/hanging out outside. The pool is huge and amazing, we had many games of pool volleyball and lilo races, it's massive!). Jacuzzi was lovely and the BBQ is amazing! We spent most of our holiday at the villa as we were having such a great time. Moraira is quite quiet, but we had some delish dinners out and cocktails in the harbour. Can't recommend the villa enough, really has the wow factor as soon as you walk in the door. Oh and the air conditioning is a life saver! Owners were super helpful and came and changed a bulb for us the day we reported it and the welcome pack was really informative. Go for it!